At the recent February 17th Berkeley BEARS 2011: Electrical Engineering and Computer Sciences (EECS) Annual Research Symposium some interesting new developments and research in the world of information technology were showcased. The first section of the symposium hosted four talks about current and future research at UC Berkeley in IT focusing on large scale data mining, aggregation and analysis; artificial intelligence and language processing; augmenting reality with virtual and mobile systems of information display and collection; and sensor/communication nanotechnology. Most notable in application to GIS, although far off, it was mentioned that work is underway to try to miniaturize the lasers in LiDAR sensors to the scale of inserting them into mobile phones to enable collective 3D ground mapping of urban areas from mobile users and for placement in building materials to monitor building occupants/conditions. More current was the talk from Avideh Zakhor about work in the VIP lab on combining data from mobile ground based sensors, similar to those used to create Google street view, with aerial photos to create 3D urban models at varying resolutions (Read more) (Video). Also in development is putting the same technology that is used to create Google street view of exterior streets in the interiors of buildings. This enables the creation of 3D interior building models and photorealistic walk through environments of interior spaces. This may have many implications in emergency preparedness/management, design, and marketing (Read more) (Example image below). Check out the BEARS 2011 website here for more information and for video recordings of the talks to be up soon. For more information on the individual presenters: Ion Stoica, Dan Klein, Avideh Zakhor, Kristofer Pister, and Jan Rabaey. 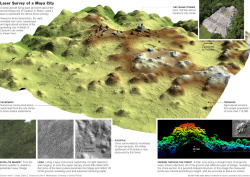 The California Coastal LiDAR Project (CCLP) is a collaborative effort to produce high-resolution topography data from Oregon to Mexico, extending from the shoreline up to the 10 m topographic contour. 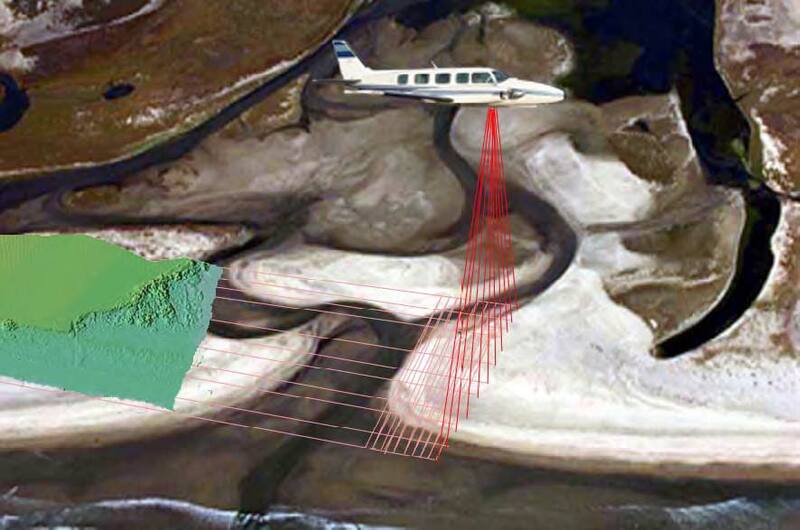 The U.S. Army Corps of Engineers (USACE) began a coastal aerial LiDAR collection in October 2009 as part of the National Coastal Mapping Program (NCMP). A combined effort by NOAA and USGS was developed in the latter half of 2009 to conduct LiDAR surveys of the San Francisco Bay Area extending from the Carquinez Strait to outside of the Golden Gate. The two projects are expected to be completed by mid-2010. Datasets will become publicly available by the end of 2010. Hot on the heels of the recent release of ASPRS LAS Specification 1.3 (mentioned earlier), the ASPRS Lidar Committee is now undertaking work on LAS 2.0. LAS Specification 1.3 added support for waveform and flagging of synthetically-generated returns. The goals and direction for LAS 2.0 are currently under discussion within the ASPRS Lidar Committee. We welcome your participation at our upcoming meeting at the San Antonio conference – Lidar Hot Topics, Open Discussion – scheduled on Wednesday, November 18, from 4:00 to 5:00 PM. 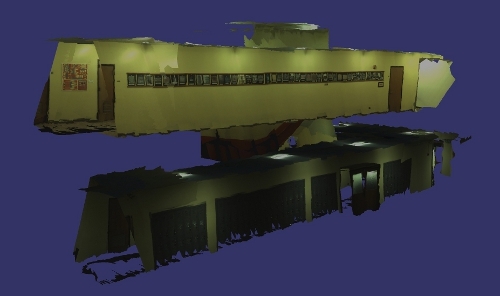 The American Society for Photogrammetry and Remote Sensing (ASPRS) is pleased to announce LAS 1.3, a new release of the open file format for lidar data storage and delivery. ASPRS has been maintaining and updating this widely used specification since its inception at the beginning of this decade. The 1.3 release adds support for waveform encoding of laser returns. The encoding of this new data extension is optional, allowing LAS 1.3 to be used as the specification in normal multi-return delivery products. I am collecting information on the costs and benefits of lidar primarily in forest research/management. Since lidar is still in the research phase in many forest applications (although there are some operational aspects to the technology), we get questions about the relative costs of lidar vs. fieldwork. I am collecting information here. 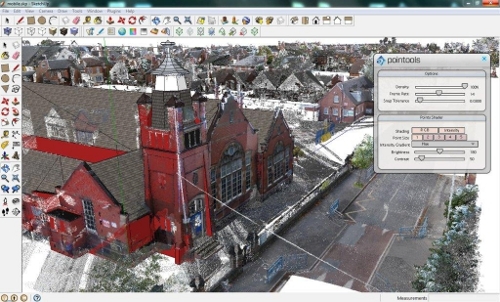 There is more information on the cost-benefits of lidar for topographic mapping and construction. See for example the blog from Merrick. State-wide mapping (e.g. NC), coastal mapping and floodplain mapping clearly see a benefit in increased accuracy and coverage from using lidar over more traditional surveying methods. See an example here from the USGS; Greg Snyder also has some nice graphics in a presentation at ASPRS available here. 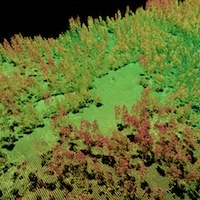 For forestry applications, however, there is less information on the relative costs of lidar vs field capture. Tree attributes such as height, dbh (diameter at breast height), height to live crown, species, age, location, basal area, volume, biomass growth and leaf area index have been measured in the field in forest plots for over 100 years. Many of these attributes can be measured directly using LiDAR data, and some can be inferred from lidar data. Stand attributes such as age, trees per hectare, mean diameter and height, dominant height, volume per hectare, form factor, annual increment per hectare and growth have also been estimated from individual plot data for some time. Again many of these can be measured from processed LiDAR data. Accuracy, which is usually estimated by comparing ground data from a series of plots with lidar values, varies with species, density, topography, lidar equipment. For example, in our SNAMP project, preliminary analysis shows r2 of 0.78 for tree height, and 0.65 for dbh. 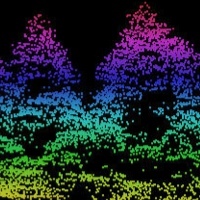 A clear technical advantage of lidar is the ability to completely inventory the forest, instead of collecting a sample of plots that might not be representative of forest heterogeneity. The derived data products that come from lidar can easily be used at multiple scales (and resolutions) as direct inputs to fire models and environmental niche models. The field plot-based approach requires interpolating between these sampled plots to generate a continuous surface. But as for costs, there are few solid comparisons. 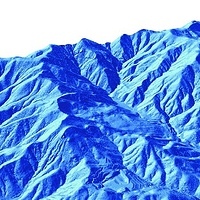 The cost of lidar includes aquisition, field data collection, and processing, which includes software and hardware as well as personnel. These can add up. Most comparisons of lidar vs. field alone concentrate on the technical advantages highlighted above. One exception is Renslow et al. 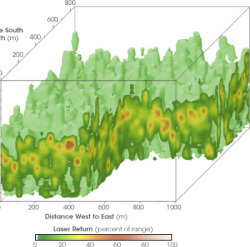 (2000) who claim that for a typical even-aged, managed forest of 500,000 acres where in each year, 2% of 10,000 acres (200 acres) are sampled to determine what management steps are needed, cost savings with lidar would be $15,400 annually. I think this is overly optimistic, as it only includes 2 weeks for analysis. Our SNAMP analysis (albeit over a much larger area) takes considerably longer. So, in proto-conclusion, I think the advantage of lidar is clearly in its accuracy and coverage, and these outweigh any cost savings that a fast and cheap field campaign might provide. Still, I will come back to this topic later with more analysis from our SNAMP project.